The UK Guardian reported yesterday that two state AG’s (NY and NC) will look into the finances of Trump lawyer Jay Sekulow and his fundraising charities. Examining the federal tax forms from Christian Advocates Serving Evangelism (2015 990), I can see why. 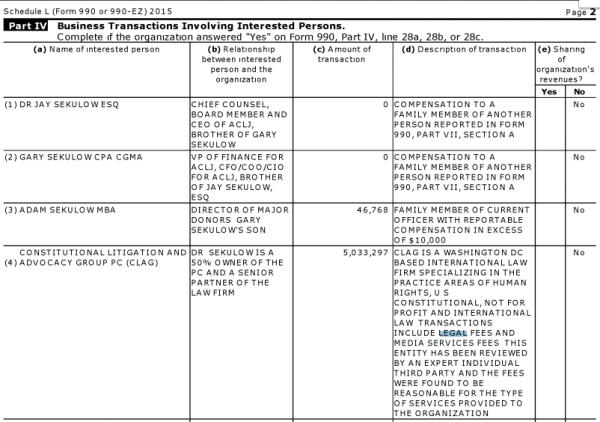 Remember CASE is the nonprofit which serves as the fundraising organization for Sekulow’s American Center for Law and Justice, supposedly a religious liberty law firm. Irrespective of size, a governing board should include independent members and should not be dominated by employees or others who are not, by their very nature, independent individuals because of family or business relationships. The Internal Revenue Service reviews the board composition of charities to determine whether the board represents a broad public interest, and to identify the potential for insider transactions that could result in misuse of charitable assets. Perhaps the name of the organization should be changed to Christian Advocates Serving Sekulows. The only person on the board who is not named Sekulow is Colby May. However, he cannot be considered an independent board member because his income is dependent on grant money received from CASE/ACLJ. 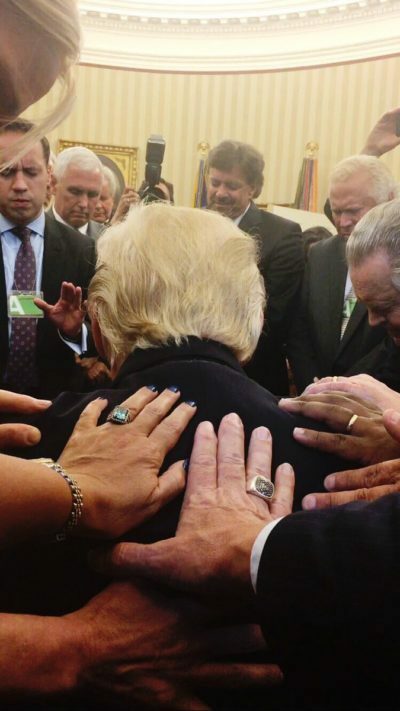 May runs the ACLJ’s DC affiliate which is completely funded by CASE/ACLJ. 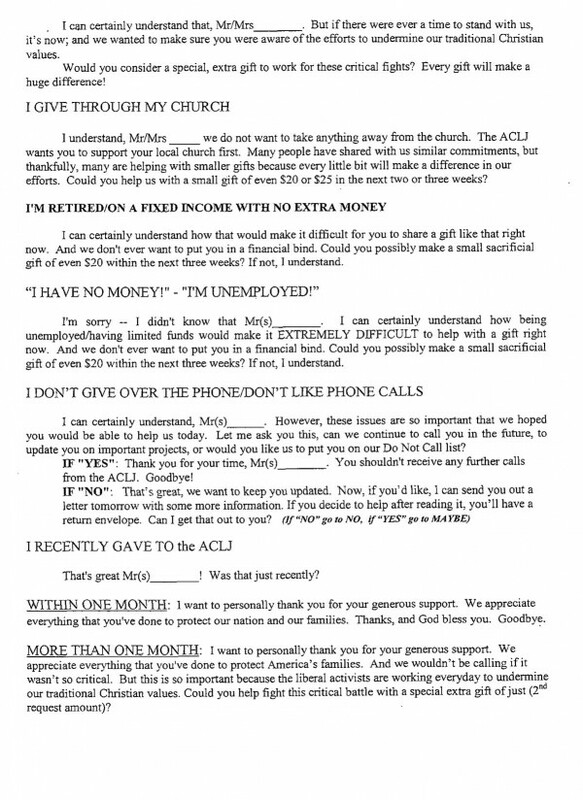 A review of ACLJ-DC’s 990 form shows May as the Director. 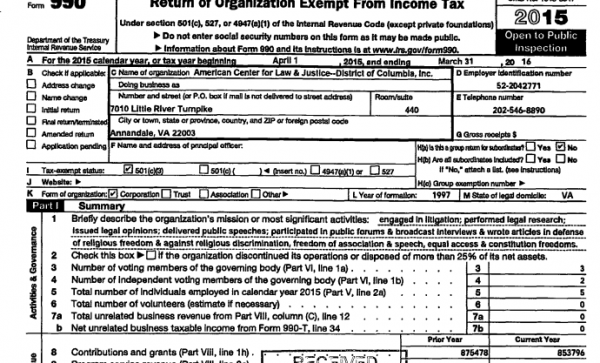 ACLJ-DC’s income was reported on the 2015 990 as $853,796. 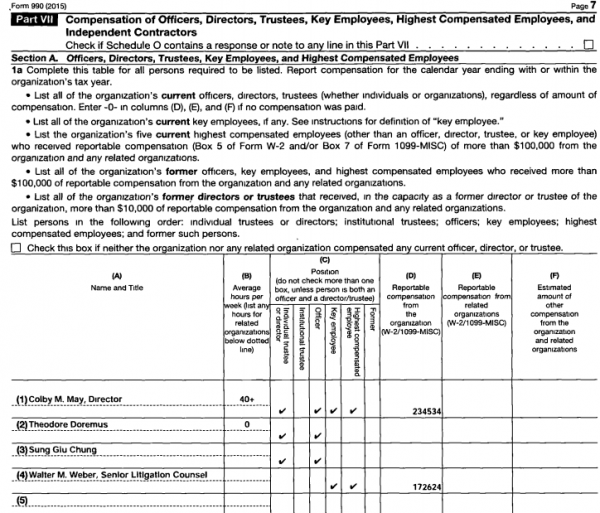 As can be seen on ACLJ’s 2015 990, a grant of the exact same amount was given to ACLJ-DC. I suspect CASE might have to provide more information to the AGs about how executive compensation was decided since none of the board members can be considered independent. Again, the IRS guidelines specify independence in setting compensation. The Internal Revenue Service encourages a charity to rely on the rebuttable presumption test of section 4958 of the Internal Revenue Code and Treasury Regulation section 53.4958-6 when determining compensation of its executives. Under this test, compensation payments are presumed to be reasonable if the compensation arrangement is approved in advance by an authorized body composed entirely of individuals who do not have a conflict of interest with respect to the arrangement, the authorized body obtained and relied upon appropriate data as to comparability prior to making its determination, and the authorized body adequately documented the basis for its determination concurrently with making the determination. Given the fact that none of the board members can be considered independent, how could this board prevent conflicts of interest as defined by the IRS? B. Conflicts of interest. The directors of a charity owe it a duty of loyalty. The duty of loyalty requires a director to act in the interest of the charity rather than in the personal interest of the director or some other person or organization. In particular, the duty of loyalty requires a director to avoid conflicts of interest that are detrimental to the charity. Many charities have adopted a written conflict of interest policy to address potential conflicts of interest involving their directors, trustees, officers, and other employees. 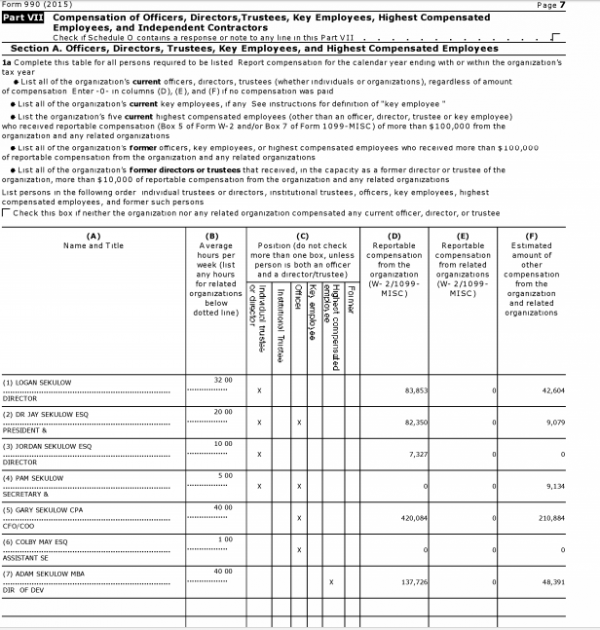 The Internal Revenue Service encourages a charity’s board of directors to adopt and regularly evaluate a written conflict of interest policy that requires directors and staff to act solely in the interests of the charity without regard for personal interests; includes written procedures for determining whether a relationship, financial interest, or business affiliation results in a conflict of interest; and prescribes a course of action in the event a conflict of interest is identified. According to the 990, a third party expert reviewed the 5-million payment to Sekulow’s law firm and said it was all fine. I hope the AGs get to interview that third party. In the spirit of transparency, I call on Sekulow and company to disclose the identity of the expert and the basis on which the transaction is reasonable. I hope the attention Sekulow is now getting will shine a light on the disgusting fund raising practices too many Christian charities use. 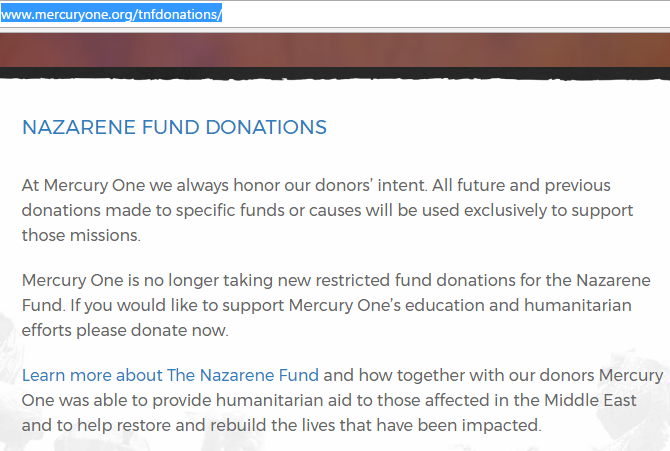 Many such charities flaunt the very values and beliefs they claim to be upholding. I hope you go read this article by the Guardian on Jay Sekulow’s fund raising tactics. I had been aware of the massive amounts of money he has raised through fear mongering but I didn’t know about the actual tactics. This is obscene. I hope reporting like this helps dry up the money flow to these people. Most charities of this size simply don’t need your money. Although dated, I have found this 2009 article on donor illusions to be helpful. The article was published on the blog of the Give Well organization, a donor support group. Give Well publishes a recommended charity list each year. Here is 2016’s list. The Give Well description of donor illusions focuses on international charities but illusions can be found in domestic charities as well (e.g., today’s post on coats for pledges at K-LOVE). As a result, international charities tend to create “donor illusions” by implying that donations can be attributed more tangibly, reliably and specifically than they really are. Some charities are more purposefully misleading than others, and some have more prominent and clear disclosures than others, but we feel that all of the cases below end up misleading many donors. The illusions illustrated in the post include loans to third world entrepreneurs, child sponsorship, and giving livestock to needy families. I have written about these in previous years as being a good example of a compelling illusion. 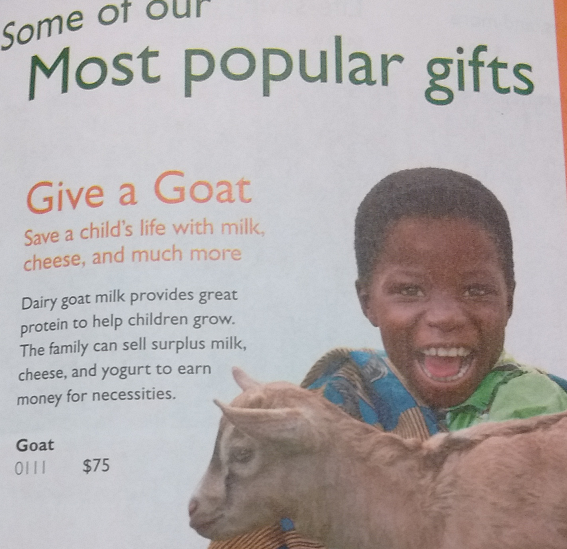 Donors can easily sell the idea of giving an animal to a third world family to Sunday school classes or church groups. The marketing certainly creates that illusion. Check out World Vision’s 2016 catalog. 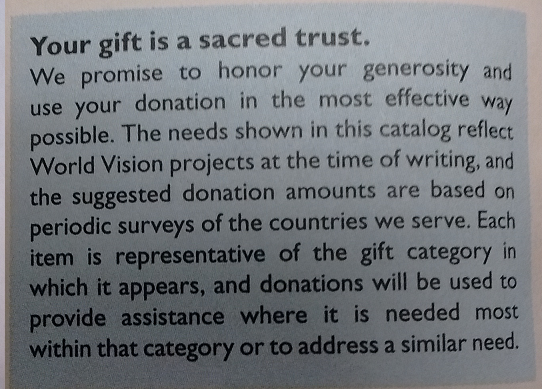 Here is what World Vision says about the gifts in the new Christmas catalog. 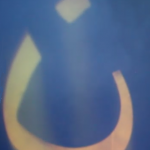 Other illusions I have covered include Mars Hill Church’s promotion of Ethiopian pastors via Mars Hill Global. In fact, most of the money donated to Mars Hill Global went to expand the Mars Hill Church video locations in the United States. Gospel for Asia for years told donors that 100% of donations went to “the field.” The illusion was created that poor church planters and Asian children were getting most of the donations. However, we have since learned that Gospel for Asia’s Texas leadership sent millions to Believers’ Church in India, also controlled by GFA founder K.P. Yohannan to build state of the art for profit schools and medical centers. While a small percentage of the money went to evangelism and helping the poor, much of it went to projects designed to make Believers’ church self-sustaining and a large portion went to India and then back to Texas to help build GFA’s state of the art headquarters. Today, I wrote about K-LOVE’s claim that a $40/month donation to K-LOVE provides a warm winter coat to a needy child. The only reason that claim might technically be true is because K-LOVE and Operation Warm set up an artificial scheme to tie coat distributions to pledges. K-LOVE holds captive coats from Operation Warm and tells prospective donors we will give a coat if you pledge. What K-LOVE doesn’t tell donors is that the coat will be given to a child anyway, pledge or no pledge. David Roodman pointed me to a typical reaction post to the Kiva story. In summary, the authors lament the lack of direct connection to a specific person they can give to and wonder why they can’t just dispense with the intermediaries. I think the post is quite revelatory about why so many charities create the illusion of direct connection. They do so because donors demand it. The demand for direct connection is baffling to me since most donors absolutely refuse direct connection to the people in need that are closest to them. Consider: how often do you or your friends take advantage of the opportunity to give directly and establish a connection by giving $20 to the guy standing at the corner with the cardboard sign saying, “Will Work for Food”? I’ll bet the answer is “never.“ And there’s a very good reason for that. You believe that to actually help that person you should give the money to a knowledgeable intermediary like a homeless shelter that will do the research to understand this person’s situation, and ensure the money you give is actually used in a responsible way. So if you would only give to an intermediary in order to help someone on the street outside your home, why do you want to do away with intermediaries between you and a person on the other side of the world whose circumstances you don’t understand at all? In the end I guess the donor demand really is for an illusion. They don’t just want connection—what they want is the illusion of connection where they can feel directly connected but not actually have to be directly connected—with all the messiness that such connections would entail—to people in need. This somewhat cynical explanation for the persistence of illusions doesn’t quite fit for me. As I have learned that charities are using subterfuge to raise money, my reaction has been anger. I want the nuance. I want to know what they are doing with the money. I am sad and angry that K-LOVE artificially creates guilt in their listeners. I know people who agonize over how much to give to K-LOVE “to keep them on the air.” When K-LOVE’s well-paid on-air personalities top off their appeals with the promise that the $40/month will trigger a coat for a needy kid, that tips the scale toward a pledge, even though the family income really can’t absorb that level of giving. It should keep K-LOVE executives up at night that their Christian brothers and sisters are denying their children and themselves basics so that they can get a quarter of a million per year (the CEO made nearly $600,000 in FY 2015). On this #GivingTuesday, give to those you have investigated. Give locally. By all means, give a needy person a coat, but do it yourself, or through a local group who is locally accountable. Apparently, the Metropolitan will return to the United States for a missions conference in February. K.P. 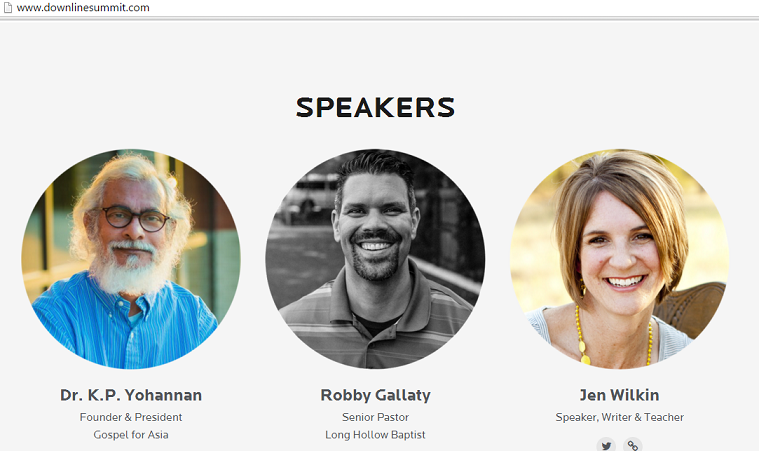 Yohannan is scheduled to speak at the Downline Summit which takes place at Hope Church in Memphis, Feb. 5-6. 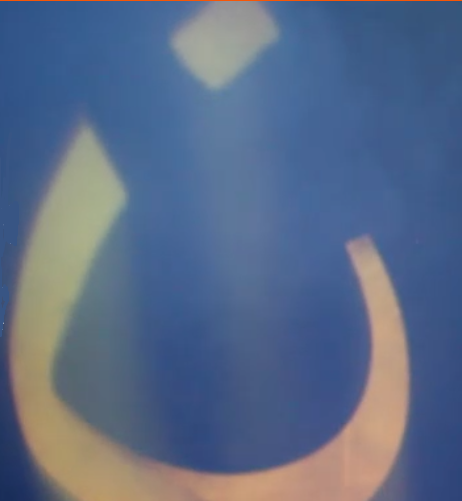 Yohannan’s organization hasn’t had the best year since April 2015. Gospel for Asia lost their membership with the Evangelical Council for Financial Accountability, was denied membership in the Independent Charities of America, was sanctioned to greatest extent possible by the U.S. Office of Personnel Management for violations of federal guidelines, was reported to the Canadian authorities for violation of GFA’s Canadian by-laws, and may be investigated by the U.K. Charity Commission, among other problems. About Gospel for Asia, CBS 11 News Dallas Asks "When You Give, Do You Know Where Your Money Goes?" The iTeam picked out a couple of big items from the ECFA report (large cash reserves, smuggling cash into India), posted here on December 2 after being released by former GFA board member Gayle Erwin. Earlier today, I reported that GFA could face sanctions from the Office of Personnel Management. GFA doubled down on their contention that the $20 million from Believers’ Church/GFA-India was not a related party transaction. Instead, near the end of the clip, GFA’s statement to CBS News calls it a “donation.” It is beyond belief that GFA maintains this stance in the face of overwhelming evidence that K.P. Yohannan is in charge of Believers’ Church and all “field partners” in India. Author Warren ThrockmortonPosted on December 23, 2015 Categories Charity, David Carroll, ECFA, Francis Chan, Gospel for Asia, K.P. YohannanTags CBS News Dallas, David Carroll, Gospel for Asia, K.P. YohannanLeave a comment on About Gospel for Asia, CBS 11 News Dallas Asks "When You Give, Do You Know Where Your Money Goes?" 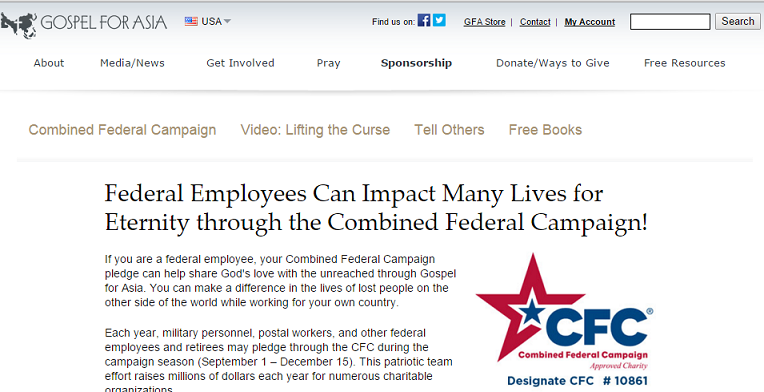 What Happened to Gospel for Asia's Combined Federal Campaign Page? As recently as a week ago, Gospel for Asia touted participation in the Combined Federal Campaign (Google cache). Not any more. Now if you go to that same page, one sees a “Page Not Found” message and a frown. 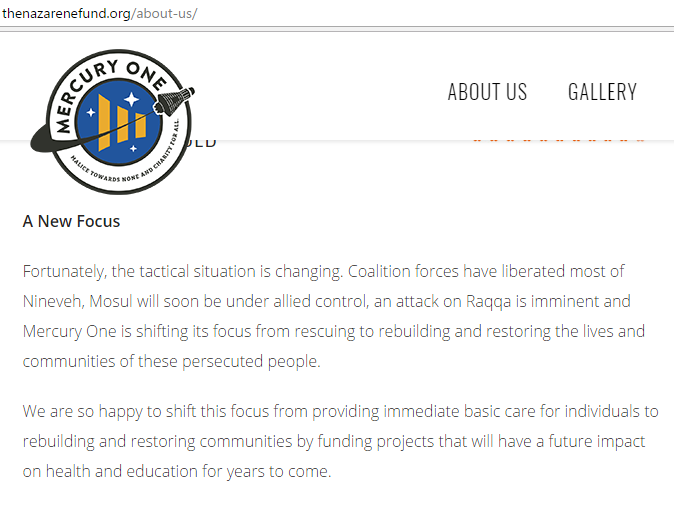 Once, GFA boasted about their participation in the CFC (Google cache), but mention of the program is now missing at that page. I have been aware for several weeks that the Office of Personnel Management was reviewing GFA’s status as an approved charity. Recently, I learned that GFA may be sanctioned by the OPM due to failure to meet requirements for participation in the CFC. Today, I learned from an OPM Spokesperson that OPM contacted Christian Charities USA about GFA. Christian Charities USA assists charities by submitting and certifying the accuracy of application for acceptance into the CFC and is managed by the same group that manages Independent Charities of America. CCUSA submitted GFA’s original application for the CFC to OPM. CCUSA contacted GFA, and gave them ample opportunity to provide evidence they were not in violation of CFC rules. However, CCUSA did not get an acceptable response from GFA. CCUSA then decertified GFA. The decertification by CCUSA may be the reason GFA has pulled the CFC page. The next possible step for GFA would be a sanction from OPM. I have been informed by the OPM spokesperson that GFA has been notified that OPM intends to sanction GFA if GFA is unable to prove that they comply with OPM standards. By statute, sanctions may involve expulsion from the CFC program. The removal of the CFC page and any mention of participation in the CFC may indicate that GFA has been removed although the OPM spokesperson has not commented on that point. Prior to the termination of membership in the ECFA, GFA had touted ECFA membership, ICA membership and participation in the CFC as indicators of financial integrity. Now there is nothing to independently verify that GFA is abiding by financial promises. Author Warren ThrockmortonPosted on December 23, 2015 Categories Believers Church, Charity, David Carroll, ECFA, Francis Chan, Gospel for Asia, K.P. YohannanTags Combined Federal Campaign, Gospel for Asia, K.P. Yohannan, Office of Personnel ManagementLeave a comment on What Happened to Gospel for Asia's Combined Federal Campaign Page?